It is common wisdom to liken one human year to seven dog years. However, the truth is a little more complicated than that. Some dog breeds mature faster and others age slower and a simple comparison to human average lifespan is grossly inaccurate. For example, an average Great Dane grows very quickly in size but only reaches maturity around 2 years of age. At the same time, its average lifespan is only 6-8 years. A Yorkshire Terrier, on the other hand, usually reaches maturity in under 12 months and has a lifespan that often exceeds 15 years. Hence, there is a significant breed variation in lifespan and rate of aging. 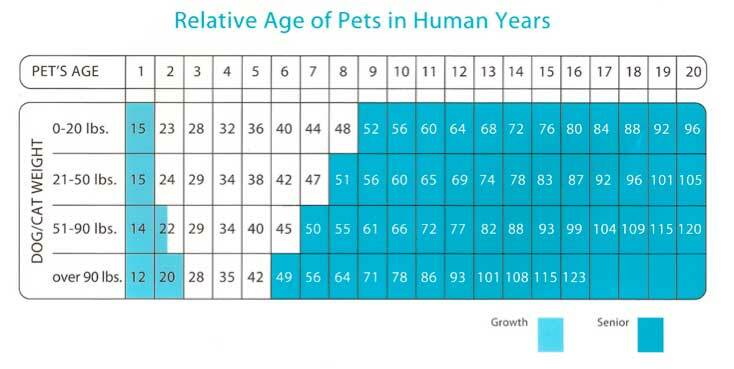 It is also important to understand that the rate at which a dog ages is not constant and therefore a linear relationship to human years is inaccurate. A rough comparison between dogs and people suggests that a dog ages the equivalent of 10 human years in each of its first 2 years of life, but then it slows down to 4-8 dog years for every one human year. One implication of the shorter lifespan and accelerated aging of dogs is that they will develop age-related, chronic diseases faster then humans would. Since most adult pets visit the vet only once or twice a year, it means that a dog receives a through “check-up” only once in several human years. It is similar to an adult person visiting its family doctor only once in roughly 4 years. In the field of preventive medicine, this is simply unaccepted. It is especially true for senior citizens (humans or pets…) who have a higher risk of developing serious illnesses. Since we assume that most owners would like to keep their pets healthy, we must find a way to monitor pets’ health at a much higher frequency. One way of doing it would be to take the dog to a veterinary exam frequently, approximately every 2-3 months. However, this is expensive and tedious, and very rarely done by owners of apparently healthy dogs. The PetPace system, which continuously and seamlessly monitors pets’ vital signs and other health attributes, helps overcome this gap. Diligent owners who apply the patented PetPace collar to their dog can have the peace of mind that it will not be “years” before their beloved Fido’s health status is thoroughly assessed.